There were 24 posts published in April 2012 (this is page 1 of 3). This sounds pretty amazing, although the devil’s in the details. I’m impressed that they get the battery to run for 7 days, although in the back of my head I wonder about whether I’d remember to charge a watch. The choice of plan takes on added weight with the addition of LTE. People with LTE-equipped iPads are finding that since LTE is fast enough to do things like stream video, they’re going through their data plans very quickly. Assuming that the next iPhone has LTE and AT&T doesn’t allow me to keep my unlimited plan for LTE, I’ll need to pick a new plan. As of right now, the iPhone is available in the US on AT&T, Verizon, and Sprint, and each has its ups and downs when it comes to data plans. AT&T: There’s a certain “devil you know beats the devil you don’t” factor at work here. Unlike a lot of people, I’ve been generally satisfied with my AT&T service. I spent most of my time in large cities, and the only places I’ve had trouble are in very rural areas (western Iowa) or buildings that tend to block cell signals. Still, AT&T doesn’t offer anything that sets it apart from the other carriers. If I stay on AT&T, it’ll probably because I didn’t have a compelling reason to leave and not because of something inherently appealing about AT&T’s service. Verizon: Verizon gets a lot of press about having the “best” network, and I’m sure at least some of it is deserved. Anecdotally, my friends who have Verizon iPhones seem to get faster data throughput on 3G than I do on my AT&T model, but it’s not a very big sample size. To me, the most appealing thing about Verizon is that they seem to be building out their LTE network faster than AT&T. My guess is that for the next year or two, LTE will be available in more locations on Verizon than on AT&T or Sprint. Then again, I tend to spend most of my time in cities that already have LTE, so geographical coverage may not be that big a deal. Sprint: The newest iPhone carrier in the US, Sprint has differentiated itself by offering unlimited data after the other carriers stopped. Today’s announcement that they’ll continue to offer an unlimited plan with LTE is certainly enticing, although they haven’t indicated what the pricing might be. I can imagine Sprint charging more for unlimited LTE data than they do for 3G. Coverage is also a question with Sprint, as they generally cover a smaller geographical area than the other carriers. Nonetheless, unlimited data could be just enough to get me to give Sprint a try. Obviously, we’ll know more whenever the next iPhone is announced. (Looks like it’ll be in the fall.) Chances are, all the carriers will tweak their current plans for an LTE iPhone, but it’s very unlikely that AT&T or Verizon would start offering an unlimited plan again. Apple sold out of tickets for this year’s Worldwide Developers Conference in about 2 hours today. A lot of developers, notably including those on the west coast, didn’t even wake up until tickets were gone. Ars Technica has some suggestions for how to fix the system in the future. Count me in favor of some kind of lottery system. The Massachusetts Bay Transportation Authority (MBTA) and Masabi have joined forces to bring a rail ticketing to handheld devices via iPhone, Android and BlackBerry apps. Headquartered in London, Masabi has launched similar tech for transit companies in the UK, eliminating ticket lines for many smartphone-wielding passengers. Software will allow riders to purchase tickets and passes that are validated with a barcode scan by conductors equipped with mobile devices of their own. Using T employees to scan the codes seems a little silly, but hopefully that’s just an interim measure while they install scanners on faregates. I hope to see something like this in DC soon! 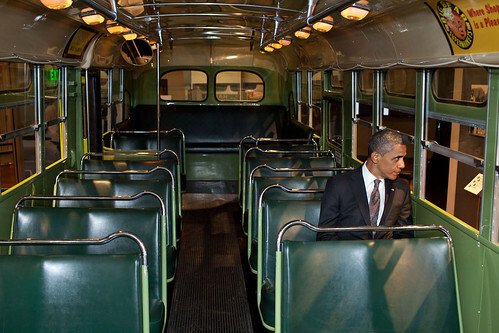 President Obama on the Rosa Parks bus. Regardless of your politics, I think you have to find this uplifting. The deal struck with Apple also allowed other players into the e-book business, including independent bookstores. Previously, Amazon’s $9.99 subprofit price was a virtually impenetrable barrier to entry for anyone who couldn’t afford to lose millions in order to gain market share. Remember that it was only after agency pricing went into effect that Barnes & Noble was able to gain an impressive 27 percent of the e-book market. Now Amazon has the Justice Department as an ally to rebuild its monopoly and wipe out other players. If the decision to charge the publishers was good for competition, why had the stock price of Barnes & Noble dropped more than 10 percent since Wednesday? Borders is long gone, and the possible loss of Barnes & Noble would be bad for consumer choice, online or off. A pretty interesting list of things that have been used in the recent past but are rare today. #3 is the only one I’ve used in practice, and I can’t recall even hearing about any of the others except #5. The biggest game changer is what I call “the grumpy old pilot” factor. Chances are, they already have an iPad and use it to show me pictures of their grandkids. So using it for flight prep is easy and natural — it’s why the iPad is so quickly being embraced by normally very conservative organizations. Each $1.99 book contains 100 strips, some old, some new, some story lines, some stand-alone jokes, some black and white dailies, some color Sundays. The idea is to create mini books that take maybe 20-30 minutes to read and which aren’t bogged down with a ton of outdated references, as happens with my older, chronologically arranged print books. Plus, they’re short enough that I can put together a fun themed book like the geeky #3.14. I used to love FoxTrot when I was younger, but I haven’t read it in years, in part because I don’t get a print newspaper. I bought book #1 and it’s really well done. Highly recommended if you’re a FoxTrot fan. I hope this type of thing takes off. Looks like the FCC is investigating Comcast’s shady bandwidth practices. I find it hard to believe they’ll do anything about it, but I’m glad they’re at least taking a look.